"Hanging in There" Is a newly built custom log cabin sitting on top of a mountain. It Is very private and secluded yet close to everything too. It has one bedroom, one bath, living room, kitchen, laundry room and back screen porch. The kitchen has custom hickory cabinets and is well stocked with everything you will need. The floors are hardwood (Maple) and ceramic tile. It Is decorated with black bears and other wildlife decor. It has a gas fireplace. You can take a morning walk in private or just watch the wildlife from the screen porch. If this beauty is not available you may contact owner for additional cabin rentals. The Yorks are from Russell Springs, KY and have visited the Great Smoky Mountains area for 30 years. We love the serenity and natural beauty of this area and look forward to spending more time there. In fact, we decided that we love it so much we bought 10 acres of property and had "Hanging in There" cabin custom built in 2015. We are really excited to own this property and are excited to share it with other couples. We know that you will love the location and will enjoy your stay! This cabin is sitting on 10 acres of mostly wooded property. It has front and back porches with a section of the back porch being screened in. You walk right from the kitchen into the screen porch where you can sit and relax. It is common to see wildlife in the yard. The cabin is built handicapped accessible with a ramp and railing leading to the front door, wide doors and openings, lever knobs, handicapped commode, etc. The bathroom has a tub/shower combination and a pedestal sink. The floor is ceramic tile. There is plenty of room to turn a wheel chair in this bathroom. Depending on the time of year you have mountain views. Front loader washer and dryer with starter detergent provided. Living room has a sofa that makes into a full size sleeper sofa. Small microwave with turn table. Fully stocked with everything you will need. The kitchen features custom built hickory cabinets, maple hardwood flooring, microwave, dishwasher, fully stocked with all utensils, small appliances and kitchen wares needed. The kitchen island has bar stools. Nice screened in back porch area with two chairs and small table. The entire house was built handicapped accessible including a ramp leading into the front door. Hanging in There is a brand new custom built log cabin. Everything in it is brand new! It is private but only minutes to town. Directions will be given upon request on how to get to the cabin and miss all the traffic! Nice quiet and Clean Cabin! Enjoyed our stay even though for a very short time. Will be back again. This has got to be the most relaxing vacation we have had in a very long time. The cabin was perfect! Every morning there were wild turkeys in the yard eating, it was fun to sit and watch them. It was very hard to leave, but we plan on being back! This was the perfect place to getaway with my husband. Everything you need. Very clean. The owners are great to work with! It was great. We will be coming back for sure. Private. Very clean and very well taken care of. Very cozy. This is the perfect getaway. My husband can't stop thanking me for his surprise birthday present. The cabin was clean, comfortable, and had everything we needed. We were able to rest, recharge and hang out. From napping to the hot tub, the cabin was close enough to town, but remote enough for privacy. 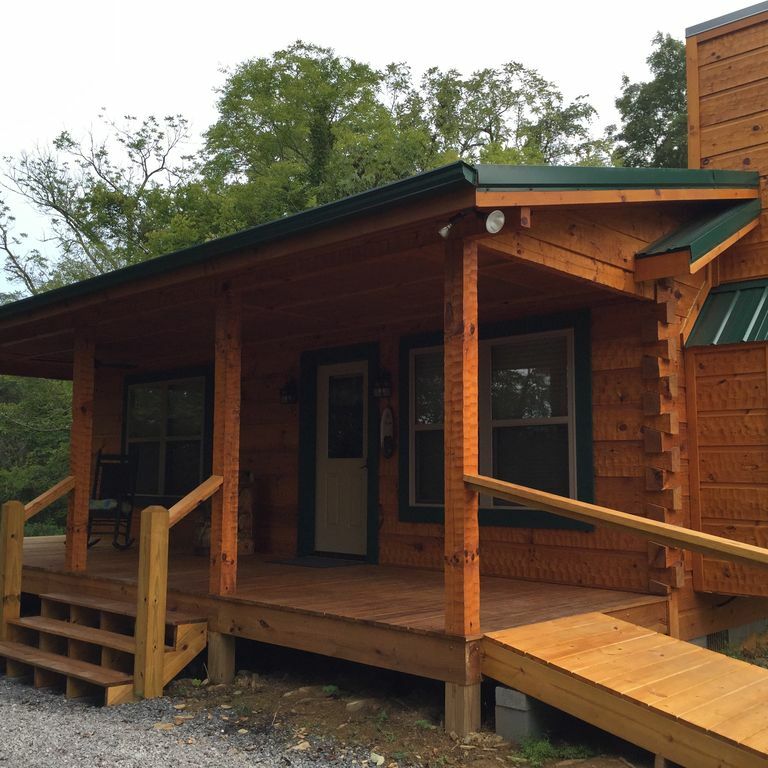 This Cabin Is Located a Short Distance (About 3 1/2 Miles) from the Wilderness at the Smokies and Sevierville Convention Center Right off Gists Creek Road on Wichert Lane.